If you are thinking of filing bankruptcy without an attorney, please be aware of the following: the bankruptcy clerk and the bankruptcy judges are going to hold you to the same standard as that of an attorney. This means that you must comply with all of the filing regulations as well as courtroom standing orders as you get set to file your case. You are also required to follow the bankruptcy code as far as pre-filing requirements, notice requirements, petition and schedules preparation, appearance at a 341 meeting of creditors, compliance with the two hour financial management instruction course, and additional court appearances if necessary throughout your case. You will also be required to communicate with the chapter 7 bankruptcy trustee or the chapter 13 bankruptcy trustee depending upon which chapter you wind up filing. 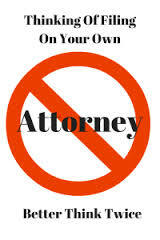 You will likely find that filing without an attorney is a difficult and burdensome process. You have to make sure that your petition and schedules are proper, otherwise you risk your case being dismissed and/or losing significant assets. Each state has particular laws based upon exemptions of property that can be protected while going through the bankruptcy process. If your petition and schedules do not effectively exempt the asset in question, the bankruptcy trustee can extract that asset from you. This is where having an experienced, bankruptcy attorney representing you will be a tremendous advantage. You can rest assured that your personal property is going to be protected to the full extent of your state’s exemption laws. You are also going to be required to submit to the bankruptcy trustee your most recent federal tax return, two months’ worth of paycheck stubs or other evidence of income, and you must complete a credit counseling session before your case is filed. You must also appear at a 341 meeting of creditors and answer questions under oath. You must also complete a two hour personal financial management instruction course prior to your case going to discharge. If you fail to take said course, your case will be dismissed without a discharge and you will not receive the benefit of your bankruptcy filing. You will also be expected to bring the proper motions in your case especially in a chapter 13 case. You may have to bring a motion to extend or impose the automatic stay. You may have to bring a motion for sanctions against a creditor who is taking collection actions after your case is filed. You might have to bring a motion to release certain property that is protected based upon your exemptions. In addition to bringing the proper motion, you will have to set that motion before the court in a proper fashion and get notice to all the creditors, the trustee, and any other party affected by the motion. By filing on your own, you are expected to understand all the processes and procedures for getting your motion filed effectively and before the court in a timely manner. Many people think that they are saving a lot of money in attorney fees when in actuality they might be hurting themselves in terms of time and effectiveness. Since bankruptcy law has become such a complicated area, it really makes more sense than ever to have a proper attorney assisting you in the process. I help many individuals who wound up filing on their own only to realize that they were not able to handle the case properly. In some cases, I’m able to jump in and save the case. In other cases, I have to recommend that the case be dismissed and we refile the right way. For more information about filing bankruptcy, you may contact my office at 847-520-8100. I offer an initial consultation at no cost and the advice can change your life.